It’s binding time! You’re in the home stretch…your quilt is almost finished…if only the binding would behave itself! How many times has your binding become twisted as you roll it around your hand or a cardboard tube for easy handling? 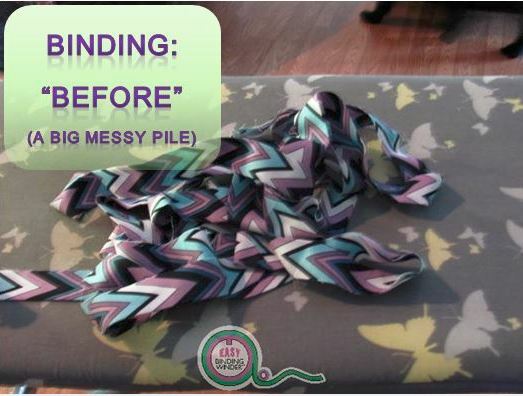 Or come unrolled and then tangle itself around the legs of your chair as you sew it to your quilt? Or become covered in pet hair as it drags on the ground? We are excited to share a new product, the Easy Binding Winder, created by Peggy Benjamin and Rex Moreland. This gadget does exactly what its name says-it efficiently winds quilt binding into a neat roll, off the ground and ready for use. Secure the winder onto the ironing board edge with the included clamp. Press your long binding strip in half, wrong sides together like usual, and tuck the end under the spool clip. 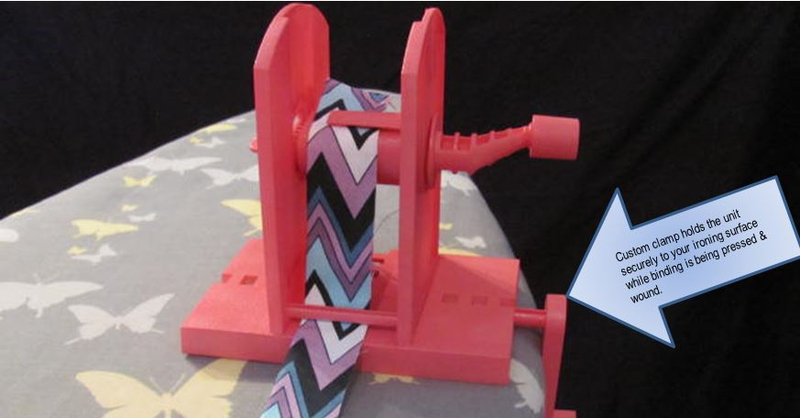 As you press, continue winding the binding strip onto the spool. The result? As Peggy says, “a neat and tidy little roll”-no twisting, no tangling. When you’re ready to stitch the binding to the quilt, it will unroll just as neatly, for frustration-free binding! 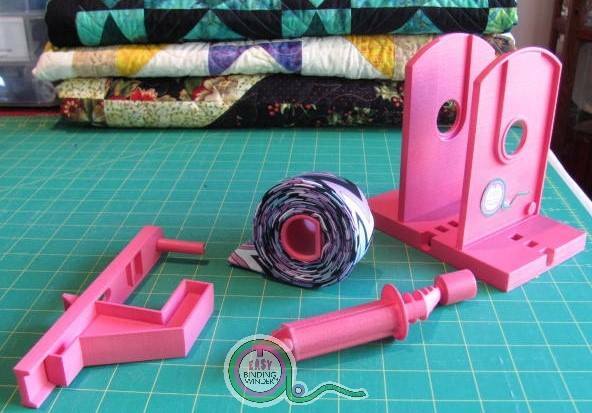 The Easy Binding Winder is made using plastic injection molding in America (Blacklick, Ohio, to be exact) based on a prototype Rex designed for Peggy. The handle turns easily to accommodate physical limitations, and the clamp adjusts to fit virtually any ironing board. Extra spools are available so you can make, roll and store bindings until you need them. 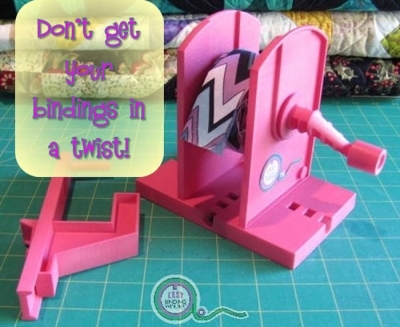 With a tagline of “Don’t get your bindings in a twist!” there’s no question the Easy Binding Winder will simplify finishing your quilt. This entry was posted in Fun!, Gift idea, Helpful Tips, Helpful Tools, Notions, Video. Bookmark the permalink. your site is very useful to me. I’ll thnx you a lot to sharing the awesome stuff.